Mix strawberries with 3 tablespoons sugar and refrigerate / keep it aside for 10 to 20 minutes to let them get juicy..
Preheat the oven to 425degrees F.
In a large mixing bowl, combine the flour, baking powder, salt and sugar together. Now add the cold butter pieces to the flour and rub it in with your fingers.. At this stage, the mixture will resemble like an oatmeal. Add heavy cream and mix until just combined. Do not overwork the dough any point . Divide them into big equal balls and place on a lined baking sheet , 3 inches apart. Gently pat them a bit till they are an inch height. Bake them for 15 to 18 mts ( ovens may vary ) / until the shortcake top turns pale golden brown. 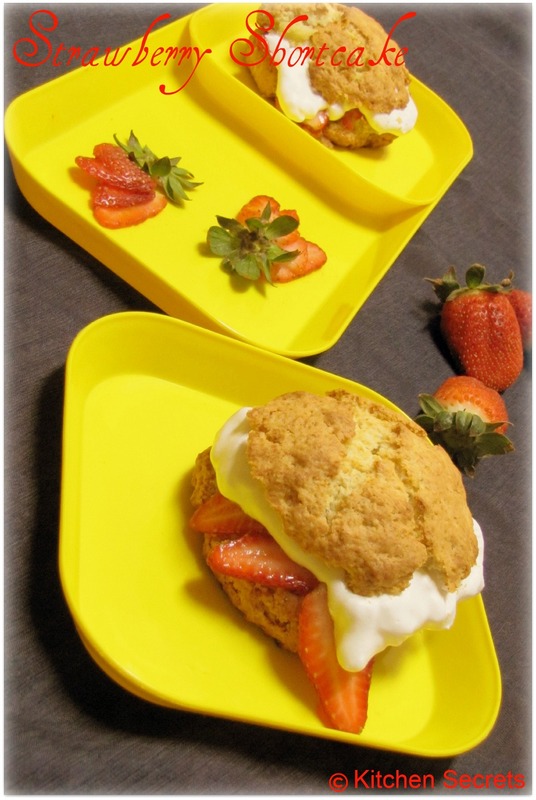 Remove the shortcake from the baking sheet and place on a rack to cool slightly. Cut each piece in half horizontally using a serrated knife. U may not need the entire quantity of full heavy cream to make a stiff dough / just combined. So make sure not to dump all the cream at once , use as per need. Ovens may vary, So keep an eye on ur shortcake after 15 minutes , Actually I overbaked my shortcake a bit. Using an electric beater beat the heavy cream, sugar, vanilla, and lemon zest until soft peaks form, about 1 1/2 to 2 minutes. Spoon some of the strawberries with their juice onto each shortcake bottom/ base . Top with a generous dollop of whipped cream and then place the shortcake top. Spoon more strawberries over the top / on the sides and serve. the Oozzing cream from the sides make me drooling!!!! Delicious shortcakes!!!! have some awards for you in my space!! do collect them!!! Shortcakes looks damn pretty and irresistible..yumm! that looks real good moist cake..lovely..
yummy n delicious! nice click! Strawberry Shortcake looks absolutely delicious !!! My my shortcake looks sooo yummmm..
perfect shortcake...perfect dessert...too good!...love it with fresh strawberries! Wow.. Looks so delicious and tempting.. first time here.. lovely blog !! yummy n tempting shortcake dear.. 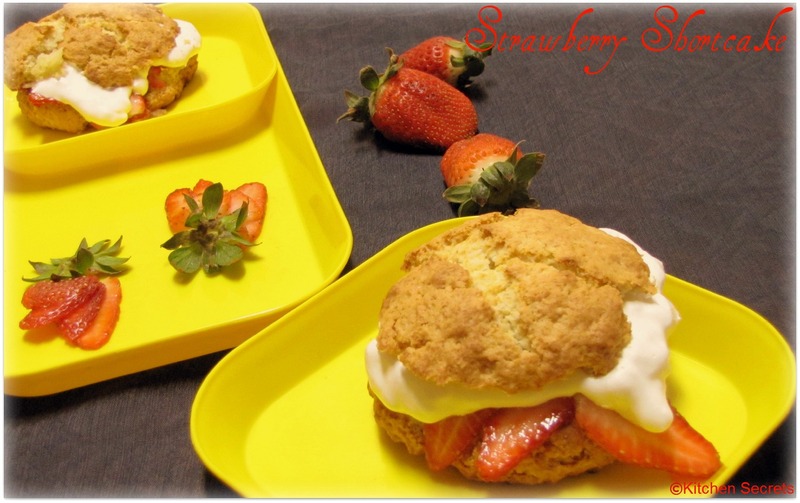 I love making strawberry shortcakes this way - with biscuits - so good. I have many them for summer lunch parties a few times - always popular with the kids too. Mesmeizing short cake.love the presentation. Shortcake looks too tempting and beautiful clicks. Delicious shortcakes love the filling.